Hair Replacement Systems | Stylistic Inc.
Wigs made from 100 percent human hair are typically the most natural in appearance and are also some of the easiest to style. Human hair wigs can be curled and straightened just like your natural hair, as long as the right heat protectant products and styling techniques are used. 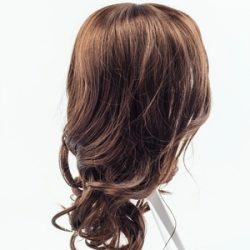 For best results, we recommend styling your wig while it is on a stand then placing it on your head for final touchups. This will allow you the best view of your hair piece throughout styling, ensuring that product is applied to all areas and hair is not being damaged by your heat tools. Whether you don’t have time to wait for your wig to dry before you head out of the house or are using hair rollers to create curls, blow drying your wig should only be done after heat protectant spray is applied. Use your blow dryer on the lowest setting to avoid heat damage and hold it about a foot away from the hair. If you are blow drying your hair replacement piece straight, a wide toothed comb can help you keep it from tangling. When choosing a curling iron or flat iron to style your human hair wig with, we recommend looking for an option made of ceramic or another heat protective surface. Along with heat protectant, this will help to reduce damage and will keep your wig looking natural and healthy. When ironing your hair replacement piece, start at a low heat setting, only increasing the heat if your tool isn’t creating the desired effect. Increase heat slowly and only to where you need it. We recommend working with small sections of hair, beginning near the roots and working towards the ends slowly. Each wig brand is a bit different, so be sure to discuss techniques and products with your stylish to achieve the best results! A full service hair salon for individuals suffering from hair loss, Stylistics can help you find your perfect hair replacement piece, coloring, cutting and styling it to achieve a natural and beautiful look you love. A custom cut can make all the difference in your wig’s appearance! For more information and to schedule an appointment, contact Stylistics by phone at 602-234-3381.